The spoon-billed sandpiper Calidris pygmaea is one of the most threatened birds on the planet. It breeds on the Chukotsk and Kamchatka peninsulas in the Russian Far East, migrates through Russia, Japan, North Korea, South Korea and the Jiangsu coast of China to winter in southern China, Bangladesh, Myanmar and Thailand, 8,000km from its breeding grounds. Its IUCN threat status was upgraded from Vulnerable to Endangered in 2004 and to Critically Endangered in 2008. The species declined from an estimated 2,000-2,800 breeding pairs in the 1970s to 1,000 pairs in 2000 to less than 250 pairs in 2014. Between 2000 and 2009, the population was declining by 26% per year. 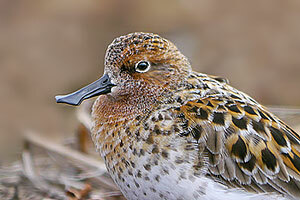 In 2010, the Spoon-billed Sandpiper was facing imminent extinction, predicted to occur in just 5-10 years. Studies on the breeding grounds indicate that the severe population decline in the 2000s was driven by high mortality of young birds – the proportion of fledged birds that returned to the breeding grounds was very low, just 0.05 birds recruited per adult per year. In contrast, adult survival (76% p.a.) and productivity (about 0.6 young fledge per pair annually) were within the bounds of what would be expected for a small arctic-breeding wader species. The species’ long-term decline is likely the result of habitat loss and degradation, particularly the reclamation of inter-tidal staging sites in the Yellow Sea, but trapping on the wintering grounds appears to be a key reason for the acceleration in the rate of decline. Some evidence suggests that most young birds remain on their non-breeding grounds for their first two years, and are therefore likely to be more vulnerable to trapping. Since 2009, action has been undertaken throughout the flyway by a wide range of people and organisations working in partnership to halt the decline. There are encouraging signs that conservation measures are reducing the impacts of some threats and bolstering the population but there is also the continuation of some key threats and the emergence of new ones. There remains a great deal of work to do. The most important and challenging aspect of which is maintaining and protecting habitat at key sites, particularly stopover sites in the Yellow Sea. At least one key stopover site remains unknown. The first site where spoon-billed sandpipers are normally observed in the autumn, the Jiangsu coast of China, is too far from the breeding grounds to be the first stopover site indicating a site in Russia remains to be found. Similarly, only a portion of the population can be found during breeding and wintering seasons indicating there are also breeding and wintering sites yet to be found. The ultimate goal of spoon-billed sandpiper conservation is a secure future for the species. Conservationists have set an ambitious but achievable aim to not only halt the decline by 2025, but increase the population by 50% (to 300 pairs) over that same period.